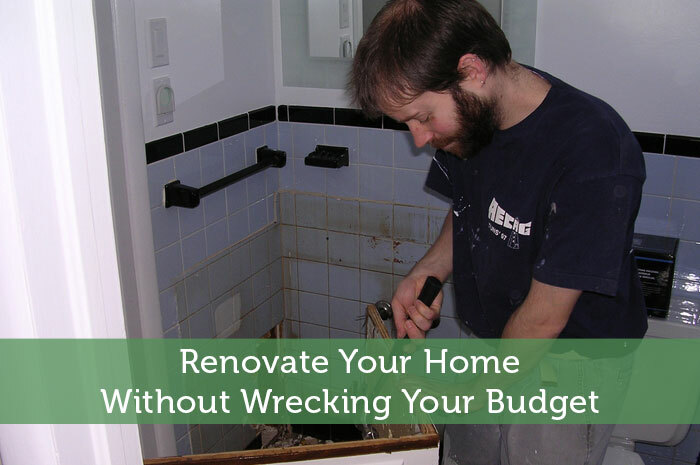 We’ve all heard the nightmare stories about a renovation budget that has blown out by tens of thousands of dollars due to inadequate financial management and planning. No matter the size of your project, it is always smart to monitor the growing costs of your renovation rather than to wait until the end for a drum-rolling “grand total” — it will undoubtedly be grander than you ever imagined. The truth is, while all home improvement projects start with the best of intentions, things can go wrong quickly if you are not careful with your finances. To protect your renovation from becoming another horror story, check out these simple tips to keeping on top of your finances when looking to renovate your property. Before you start swinging the sledgehammer, create a financial budget. Factor in every possible expense you can think of, including the unavoidable costs such as council fees and the preparation of preliminary plans. Allow at least $2,000 for this. In addition, consider builder’s fees and materials, architect’s fees, storage fees and bank fees for taking out a personal loan or extending your mortgage. Be wary of overcapitalising, especially if the idea is to add profit to your home at sale. Always do you best to be strict with your money. A smart idea is add a contingency of around 10-15% to your overall budget. The reason is there are always costs within the renovation that you may have under-estimated or not even considered. Having that 10-15% cushion will help you sleep a little easier at night. If you’ve owned your home for a long time, it’s likely you have some equity on your mortgage that you can borrow against to finance the renovations. This is the most common way Australian’s finance their home improvement. While home equity loans usually have cheaper, more competitive interest rates than personal loans, be aware that, depending on your repayments and the mortgage term, adding the costs of the renovation to your mortgage will increase the term of your home loan – with interest. In addition, recognise that borrowing against the house means you could lose the roof over your head – renovated or not – if you can’t afford to make the repayments. On the flipside, if you have recently purchased a home and do not have any equity available, a personal loan could be the preferred option to fund your renovations. A personal loan allows you to borrow anything from $5,000 for smaller projects right up to $50,000 for bigger home improvements. You can also choose to pay it weekly, fortnightly or monthly over a loan term from one year up to seven years. This can be a much faster way to cover your costs than adding them to your home loan. Note, a personal loan has a much higher interest rate than a home equity loan and is better suited for financing minor renovations such as a new bathroom or kitchen. At first glance, hiring someone to do the job may sound expensive compared to doing it yourself, but this is not always the case. A professional can bring a number of cost-saving ideas and trade-secrets to the table that you may not be aware of. For example, an architect or stylist often see problems with a renovation before they occur, whereas the problems may only become apparent to you after you’ve completed the work. Additionally, builders can obtain cheaper rates on raw materials, as well as negotiate on your behalf with the local council on potential construction sticking points. Most councils will charge a fixed fee for every DA application submitted – whether it is successful or not – and without the support of a professional, a do-it-yourselfer could potentially find themselves lost in an expensive bureaucratic merry-go-round. That said, the quality and prices associated with using an expert in the building industry varies dramatically. When choosing an architect or tradesman, it is important to ask around for advice, particularly from others who have been through the renovation process. Ask if they can recommend anyone, especially if you like the job that has been done on their renovation. In addition, shop around and get a minimum of three quotes for each task. Keep a scrapbook of the things you like when it comes time to plan what you want it can all be easier to show the architect or builder the look you are after. Plan for council approval; getting council approval for structural work, extensions, or additions can easily take 6 months or more – so plan ahead. Complete the entire renovation in one hit, not in stages. There are many parts of the house that are interlinked e.g. plumbing, electrics, gas. If you a renovating a kitchen and bathroom, do them at the same time so that you don’t have to double-back in areas. Digging up a draining line for a second time is not only time consuming but unnecessarily expensive. Consider the long-term costs. Pre-finished materials can be costly, but work well if it saves you time on an extensive paint or finishing job. Reap big savings with recycled or lightly-used fixtures and building materials. Renovations don’t have to be difficult or expensive. If you act early, have the right advice, borrow within your means and monitor a strict budget, a renovation can be extremely rewarding. Laying the foundations for a healthy renovation budget will not only keep your head above water, it will also reward you with a fantastic home face-lift or extension that will add value to your home when it comes time to sell. There was a time when I had absolutely no idea how to do renovations myself. After becoming a homeowner and landlord, I quickly learned how to do basic repairs. I usually decide whether to DIY or hire it out based on the size and scope of the remodel. If I can handle it and have the skills, I’m in for DIY. If not, I definitely hire somebody. This is definitely something I’m going to have to figure out once I move into my own place. I can probably handle a lot of stuff on my own especially with the help of youtube. I’m sure there will still be a lot that I’d rather pay someone to do though. I definitely want to learn how to do things myself, but I am so restricted with time that I know we will have to hire out for some things. Time is a big factor in all of this. When you’re doing so much work online and making good money at it, you have to consider how much time you’d have to sacrifice and how much that time is worth. I did a home renovation back several years ago and my big tip there is make sure you get quotes for everything. This way if someone slaps you with a big bill in the end you can hold them accountable. Good advice Chris. Contractors must love when people don’t ask for quotes. In those cases they are free to charge whatever they want once the work is complete. I have had to do a few home renovations in order to fix a few issues with our current home. If we were to jump into a home reno project, I would probably take a dual-pronged approach where I would do a lot of the work and then get a professional to do what I can’t handle. This keeps the costs low and gets your hands dirty. I like that approach. With most projects there is probably a lot of initial work that can be done relatively easy. There’s no point in paying a contractor full price for that easier work. I’d probably be leaning towards doing something like that since I’d be worried about the final product looking good. It’s hard to know when to call in a pro. I like to think we are pretty handy, but anything that involves electricity usually gets farmed out. Time is a big factor as well. I can paint, but if it took me a month to compete something, it might be better to hire it out. Yep I don’t think I’d touch anything involving electricity. Some things just aren’t worth messing with when you don’t know what you’re doing. Time would also be a major concern for me, but I guess some things would still be satisfying to do yourself even if it took some time. I like to do as much as I can by myself before I will hire somebody. If I think I can do it I will do it all but if it comes to something I’m not comfortable with I don’t wan to ruin it and waste money and time by having to redo it because I messed up I want a professional to do it. That’s a good plan, but I’m just not sure at what point you should call a pro. It seems that for a lot of things you won’t know it’s not being done right until it’s too late. I love DIY! If you plan far ahead of time, you can pick up materials from goodwill or by peoples’ garbage cans on trash day. You’d be surprised what people toss that can be used for home reno projects! Also doing it yourself is always the way to go if you do your homework and know what you’re doing. You can find most things on the internet or by talking with someone at Home Depot or something. If you have the time and patience, you can save LOTS of money by DIYing and picking up free materials from around town! I want to do some DIY, but I haven’t had much change to showcase my handy side to my girlfriend. So I don’t think she’d trust me enough to handle anything major. Then again I probably wouldn’t trust myself either lol. You can save a bunch of money by doing the demo and cleanup work yourself. I would look on Angies list and hand pick a few select experts to come over and help you out instead of hiring expensive contractors. Good suggestions Darnell. I have no idea how popular Angies list is here, but it’s worth checking out. For common renos you don’t necessarily need to hire someone expensive. Hell I’d be fine hiring someone who’s only done some of that stuff a couple of times if it would result in significant savings. DIY what you can and never, ever take out a loan for home renovations! What if you were planning on selling your home and the renovation could really improve the sale price and ability to sell? It seems that might be one legit reason to take out a loan for renovations. In other situations though I do agree that you shouldn’t borrow money for it. Well, we were in that situation with our last house. We chose to do it without debt. Very shortly after, the housing market imploded–if we’d taken out another loan, we would have lost our shirts. As it was, we came out about $60k ahead. Taking on more risk is a dangerous, dangerous game, and not one I want to play with my primary residence ever again–as it was, our choices that seemed very prudent at the time nearly blew up in our faces. For a rental property…sure! Primary residence? No, no, no, and no….. I think the housing crash was a very unique experience though. The average home owner probably could get away with using a loan to pay for renovations when they are planning to sell. Without doing those renovations, they might struggle to sell or struggle to get top dollar. Our house we bought for about 70% of its market value because it was really, really, really weird. Because it was a strange house that was priced REALLY low due to its weirdness, remodeling to fix the floor plan paid off. That’s a freak occurrance, though. Well it depends on which renovations you do. Some pay off much more than others. You also have to consider the extra level of satisfaction you’d get from those renovations. That extra level of happiness can be priceless. The wife and I have recently become landlords and we are spending a lot of time trying to learn some basic DIY stuff. My wife is taking a woodworking class and we will be taking a basement finishing class in the near future so that should help. Recently we have painted several rooms in our condo and soon we will try to put up a tile backsplash in the kitchen. I’m not the best at it, but it is fun to try! Taking a course is an interesting approach. That is bound to be better than just watching a youtube video or two and just winging it. I think a kitchen tile backsplash might be the kind of project that I’d be willing to try myself. Good luck with your renos Nick. I finished the basement and converted electric heat to a boiler run on natural gas. I did both jobs myself. To put the boiler about a foot above the ground, a friend helped me lift it up. This summer, I am planning to finish basement of the house that we moved in 5 years ago. I plan to cost it out and see how much it would come out to be. You not only save money but you learn so many things by doing it yourself. I strongly believe that if you have Home Depot or Loews in your town, they are both always eager to help you out. They have classes for a variety of jobs. I think that sounds like a bigger project than I would tackle, especially with natural gas involved. I’d be too paranoid about a gas leak. Besides I have a step brother who specializes in that kind of stuff. So I think I could somehow convince him. It would be cool to learn how to do random renovation and repair work though. You’d feel so much more independent. Youtube has been my bestfriend in regards to home renovating. Great tips on budgeting, I tried to install ceiling fans throughout our home and eventually did so, but at the cost of breaking one in the process. Wife wasn’t too happy but it was still a lot cheaper than hiring someone to do it. That would be a nice addition to keep your place cool. It would seem like an easy enough project, but I don’t see myself trying to do that on my own. Not only could the electricity be a problem, but it could be a bit dangerous if the fan falls. It probably is best to not rush into any renovations. Over time your original plan may change or you might come across someone who can help. Besides there aren’t a lot of home renovations that need to be done right away. When we move into our condo I think the only thing well try to do early on is replace the blinds. Everything else can wait. I learned this the hard way. We wanted to remodel in stages and had it all planned…then when we started talking to contractors I discovered that one hit would be FAR cheaper. That makes sense. Sometimes when you change one thing, other things have to be removed and replaced. Moving those things around more than once just adds up. Or you might be able to get a better hourly price on labor if you’re giving them more work. Once I became a landlord, I learned how to do a lot of simple repairs myself. I still need help on the big stuff but I save a lot by doing the little repairs myself. Yeah I think almost every landlord should be able to handle the simple stuff otherwise you just lose too much profit. When it comes to big stuff though, time and expertise is bound to hold most people back. I love DIY projects. I feel like I am pretty handy with things around the house and I am not too stubborn to know where to draw the line and hire a professional. Home Depot and Lowes are great resources for classes and questions to begin learning how to DIY while saving a lot of money. I have a feeling I’ll be contacting a bunch of the commenters here about DIY when I get down to it myself. Between all of you, there’s probably a lot of good advice for various projects. I’m sure I can handle some stuff, but making it look nice is another story. If I was going to build an addition, I might opt for a professional, but anything less I would probably DIY. Both of my grandfathers built their first home themselves. I come from a family of handymen. Heck, even my Eagle Project was remodeling a church bathroom! Maybe my dad might’ve passed on some DIY skills since he’s a carpenter. Or maybe I could convince him to come visit and help us with stuff lol. I wouldn’t want to have to pay professionals to do too much of it. it would be great! It’s so hard to find a good worker so make sure to supervise the work every minute. I’m not sure how practical it would be to supervise every minute. People lead very busy lives these days. Part of the reason I would hire someone is because of the time factor. So doing constant supervision would be counter productive. Instead I’d try to hire someone based on a personal recommendation, ideally someone they personally know. Lots of great advise here. I would add that even the smallest DIY project can go wrong in a hurry. If you are not an expert in some areas, like plumbing and electrical, it is OK to DIY and then hire out the jobs like that. If something goes wrong while you are trying to “figure it out” you may pay twice as much! To fix your mess and get it right as well! That would be very frustrating to spend all that time only for it to go wrong and to have to pay someone more in the end. Plus it would be a bit embarrassing. It really is important to accept our limitations and not just assume that we can figure everything out. At least do some reading online to get a grasp on what projects are easy enough to do on your own. Insulation is not mentioned as a DIY project but many times it can be. We have homeowners in the area who rent equipment from us and we deliver the rolled insulation so they can do it on their own! Sounds like an easy enough project. At least it’s not something that you have to worry much about how it looks. DIY home improvement projects can really help to give you a sense of ownership for your home. I own a home renovation company, and I agree with Jason. It is ok to complete small renovations on your own, but when it comes to major renovations that involve plumbing and electrical you are better off to hire a professional. Hiring a contractor will also help you to stay within your budget too. I’m really hoping for that sense of ownership when I do some renovations for my new condo. I can’t say I’m too confident to take on very many of those projects myself, but I’ll at least look into it. In the end I’ll probably have to hire someone to do most of the work. I am excited to make the condo really ours. Great article! I guess with any DIY project its all down to Planning, Planning, Planning! I planned my Kitchen re-build for about 3 years before actually having the nerve to start ripping out the old one! I couldn’t agree more with some of the comments above tho, try and save money where you can with doing the small jobs yourself (labour intensive stuff) but definitely leave things like electrics and plumbing to a pro, I find those bits rather scary! I don’t think I’d have the patience to wait 3 three years for something like that. I’d start to get too excited and want to get started right away. Fantastic info! One other thing you can consider as you try to save costs on renovations, is the potential savings on homeowner’s insurance. Some projects like upgrading windows and doors, installing a privacy fence, or installing/upgrading a security system could cut the cost of your insurance premium. Good point. Those renovations could definitely help with insurance as well as extra peace of mind. Some of that stuff may be due for an upgrade anyway. In my opinion, it is always best to hire professionals when it comes to plumbing and electrical. There are too many things that can go wrong. With that said, nothing wrong with the barter system! Those are two areas that I wouldn’t touch either. I was going to replace the faucet and showerhead in the bath of the condo we were supposed to buy. That’s about as far as I’d go though. I think the most important part of any remodeling project is the budget and working with a contractor who can help you make good decisions when it comes to using it wisely. Check references on the internet. References on the internet are great, but personal recommendations are even better. Definitely don’t just hire a random contractor without having some kind of background info about their past work. “Suppose one of you wants to build a tower. He will first sit down and estimate the cost to see whether he has enough money to finish it, won’t he? This statement is came from the Bible text that gives us a great lesson us before spending our money for home renovation. One of the most important thing you should consider before starting a project is you should plan it ahead. So that you can prepare all the necessary things to do. It is crucial that you have a very clear goal in mind for what the finished project will look like. You should have a drawing on the details before any actual work begins. What are the home improvement stores you can purchase materials and quality appliance to be use such BaseBoardRadiatorCover.com and make notes of what things you like and what things you don’t. Awesome way to cut down my budget of renovating my house. Now I can think about to make my home more beautiful.